The Brooklyn jazz pianist Jesse Stacken has led a trio with the bassist Eivind Opsvik and drummer Jeff Davis since 2005. He’s fascinated by rules, and lately he’s been into writing daily or weekly études and self-challenging exercises; on “Bagatelles for Trio” he uses his band to carry out 13 plotted pieces that cut between languages of improvisation and composition. You don’t remember the tunes so much as the ideas behind them. They drive the pieces, introduce various kinds of improvisation into them, bring them to a close. (He’s into Schoenberg, and a few of these use the 12-tone system; he’s also into Morton Feldman, and “Bagatelle No. 5” achieves his slow, floating-sound ideal). Looks fine on paper, but the tacit challenges almost outweigh the articulated ones: in doing this he’s got to make the individual pieces sound like more than the sum of their ideas, and he’s got to sequence them into an album with some narrative or development or flow. I think he’s done it. This is a sharp, well-practiced group, making generous, voluptuous subtleties out of formal ingredients. Ever since the seminal Charlie Parker With Strings (Mercury 1950), numerous artists have attempted to add symphonic strings to jazz ensembles. Some have succeeded, but many have failed to capture a proper balance, resulting in string arrangements that sound superfluous. Bassist Ben Wolfe's fifth album, No Strangers Here, is one example of a successful merger of two worlds—acoustic jazz quartet and classical string quartet. A compelling bassist, Wolfe came to prominence as a sideman for Harry Connick Jr., Wynton Marsalis and Diana Krall. He currently teaches at Julliard and is a member of the Jazz at Lincoln Center Orchestra. Augmenting a jazz combo with strings is not a novel idea for Wolfe, whose previous album, My Kinda Beautiful (Planet Arts Records, 2004) featured a brass heavy jazz octet with an eight piece string section. An extended suite, "From Here I See," was commissioned by the Rubin Museum and revolved around a jazz quartet/string quartet combo. Another long-form composition, "Contradiction: Music for Sextet" was the result of a commission from Chamber Music America. Wolfe's core quartet features saxophonist Marcus Strickland, pianist Luis Perdomo and drummer Greg Hutchinson, all rising stars on the New York scene who execute Wolfe's tightly arranged compositions with palpable commitment and panache. In addition, Wolfe regularly augments the quartet with a traditional string quartet, as well as a handful of special guests. At their most vigorous, Wolfe's pieces recall the forward thinking hard-bop of a mid-60s Blue Note date. "The Minnick Rule" and "Circus" are labyrinthine swingers filled with hairpin rhythmic shifts and understated string accents that resound with dramatic flair. A nostalgic air often permeates the session; the subtly integrated strings reinforce Wolfe's romantic side by adding a layer of euphonious lyricism to his sumptuous writing, most notably on the title track and "Blue Envy." The special guest appearances are well integrated. Terell Stafford's buttery trumpet soars on the spirited opening cut and offers supportive nuance on the wistful closer. Saxophonist Branford Marsalis and drummer Jeff "Tain" Watts provide muscle to the escalating drama of the noirish "The Filth" while Marsalis' soprano waxes lyrical on the effervescent "Milo." Victor Goines enriches the lush "Blue Envy" with his poetic bass clarinet. The album's string quartet tour-de-force, "Rosy & Zero," regales with expansive sonorities. Alternating austere chamber music inflected excursions with blistering post-bop interludes, the piece unfolds like a long lost, albeit highly successful, Third Stream experiment. From bittersweet nostalgia to cinematic drama, No Strangers Here encapsulates an array of moods, textures and dynamics. Reminiscent of the string augmented ensembles of Max Roach and Charles Mingus, Wolfe's double quartet emboldens the jazz tradition with neo-classical overtones, yet never fails to swing. To quote Wynton Marsalis, "Ben Wolfe swings with authority." The Minnick Rule; No Strangers Here; Milo; No Pat No; The Filth; Circus; Blue Envy; Rosy & Zero; Jackie Mac; Groovy Medium. Ben Wolfe: bass; Marcus Strickland: tenor and soprano saxophone; Luis Perdomo: piano; Greg Hutchinson: drums; Cyrus Beroukhim: violin; Jesse Mills: violin; Kenji Bunch: viola; Wolfram Koessell: cello; Branford Marsalis: tenor and soprano saxophone (3, 5); Terell Stafford: trumpet (1, 10); Victor Goines: bass clarinet (7); Jeff "Tain" Watts: drums (5). There's only one problem reviewing an album by Hiromi Uehara, but it's a big one. You can quickly run out of superlatives. 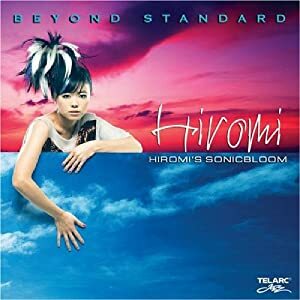 On Beyond Standard, her fifth album and the second one under the group name Hiromi's Sonicbloom, the always adventuresome pianist doesn't so much pay tribute to standards such as Duke Ellington's "Caravan" and Rodgers and Hammerstein's "My Favorite Things" as break them apart, put them back together in a way that best pleases her and generally deconstruct the whole idea of paying homage to old songs. What's the point of slavishly recreating note-for-note an old chestnut like "My Favorite Things"? It's not as if it can be improved, so why not just have some fun with it? With the addition of guitarist David "Fuze" Fiuczynski, the band is able to go places it had previously been unable to on Brain (Telarc, 2004) and Spiral (Telarc, 2006), which is most evident in the reworking of Uehara's own "XYZ." The song is reincarnated here as "XYG," or "reborn with guitar," as the track notes indicate. Fiuczynski's guitar excursions seem more attuned to his band mates here than on his debut with Hiromi's Sonicbloom, the ambitious, but occasionally messy, Time Control (Telarc, 2007). Fiuczynski can play his axe like nobody's business, but is guilty of overplaying on occasion and pummeling the listener with a sonic assault. He hasn't mellowed on Beyond Standard as much as he has learned the virtues of restraint. "XYG" and a torrid version of Jeff Beck's fusion classic "Led Boots" not only give Fiuczynski ample opportunity to stretch a bit, their inclusion faithfully keeping with her refusal to be pigeonholed into any tidy categories. The rhythm section of bassist Tony Grey and drummer Martin Valihora deserves a shout-out or two as well as both are as versatile and virtuosic as their band mates. It must be a matter of synchronicity that, at the time when the power quartet of Chick Corea, Al Di Meola, Stanley Clarke, and Lenny White are touring again as Return to Forever, Hiromi's Sonicbloom is making a serious bid to be the Young Turk, picking up where RTF left off and taking it even further. Because this is Hiromi we're talking about here, there has to be at least one slightly loopy example of inspired insanity, and here it's the nearly six-minute solo piano of "I've Got Rhythm" that is equal parts dazzling and dizzying. This is not just a good album; it's a fun album. The absolute nuttiness, yet undeniable proficiency and technique on display on tracks like "I've Got Rhythm" and "Claire De Lune" serve as cheerful additions to Uehara's efforts on Beyond Standard. At some point in her career, Hiromi Uehara may mail it in and make a half-hearted or lousy record. But so far she's five-for-five in producing music that is unfailingly brilliant, innovative, radiant and clever. Hiromi's Sonicbloom is a shot of adrenalin for tired musical tastes. Intro: Softly As in a Morning Sunrise; Softly As in a Morning Sunrise; Clair De Lune; Caravan; Ue Wo Muite Aruko; My Favorite Things; Led Boots; XYG; I've Got Rhythm. Hiromi Uehara: piano, keyboards; David Fiuczynski: fretted and fretless guitar; Tony Grey: bass; Martin Valihora: drums. Though Ben Wendel and Dan Tepfer could be considered newcomers as compared with 75-year-old saxophone master Charles Lloyd (who also recently released a duet album, "Hagar's Song," with pianist Jason Moran), they show as much restless invention on "Small Constructions." While still a duet, the album lives up to its name with some judicious multi-tracking, allowing Wendel (co-leader of the genre-skipping jazz-rock group Kneebody) to seamlessly switch to melodica and bassoon, such as "Still Play," the opener, and "Gratitude," which expands with a quiet grace. Tepfer, who justly earned raves in 2011 for tackling and then improvising to Bach's Goldberg Variations, is as much a standout with the insistent "Nines" and the tumbling "Rygabag." There is a 19th Century short story by author Frank Stockton entitled, The Lady, or the Tiger? The hook of that work is the teaser leave-you-hanging ending: is there a Lady or the man-eating Tiger behind the door that is selected and "opened." WithHotel Souza, her second CD, Buenos Aires-based vocalist Karen Souza leaves little to the imagination. This hotel has musical rooms of exquisite talent, beauty, elegance and intimacy. Displaying sensuality without a cloying phoniness, Souza delivers eleven beautifully-performed and impeccably-arranged songs, backed here by some of L.A.'s "usual suspects." The result is a marvelously entertaining tour d' hote. Souza's voice is one of elegant restraint and sensuousness. Hers is not an overpowering vocal presence, but rather, a very inviting one. She seduces deliciously with gentleness and whisper-to-the mic sultriness. That feeling is pervasive across an interesting selection of ballads, bossas (Antonio Carlos Jobim's "Dindi"), softer swing ("Delectable You," "Full Moon") and soft-rock grooves ("Night Demon"). She hits a soulful home run with a dark blue rendition of Marvin Gaye's classic, "I Heard It Through the Grapevine," recorded here with members of Gaye's original band. The Joel McNeely arrangements are slick and frame Souza well without over-dominating her. That savvy set-up allows Souza's lyric and tonal skills to dominate. Her diction, phrasing, dynamic nuance and intonation are exceptional. In addition to her song-styling chops, the compositions Souza co- authored here—eight of them, demonstrate that she has a flair for the melodic and poetic. The ensemble and brief solo outings across the board are First Class and without studio sterility. The famous Michelin Travel Guide may rate the world's hotels and attractions and not musical fare. Perhaps if they did, Hotel Souza would score extremely well. Select any musical door here and a Lady of exuberant talent and taste awaits. Paris; Night Demon; My Foolish Heart; Delectable You; Break My Heart; I Heard It Through the Grapevine; Wake Up; I've Got It Bad; Full Moon; Dindi; Lie to Me. Karen Souza: vocals; Alan Pasqua, Tom Ranier: piano; Trey Henry: bass; Larry Koonse, John Goux: guitar; Jaime Branly, Ralph Humphrey: drums; Steve Kujala, Brian Scanlon, Dan Higgins: woodwinds; Rick Baptist, Wayne Bergeron: trumpets; alan Kaplan: trombone; Brian Kilgore: percussion; Roger Wilke: Concertmaster; Track 6: "I Heard It through the Grapevine": Dany Thomas: acoustic piano, Hammond V3, keyboards;Andre De Santana: arranger, electric and upright bass; James Gadson: drums; Edgar Sandoval Violin; Horns: Miguel Gandelman: sax; Ray Monteiro: trumpet; Garrett Smith: trombone. Eldar's Breakthrough, recorded at Avatar Studios in New York City, releases April 9. Like the 26-year-old's 2009 disc Virtue, it features his long-standing touring trio with bassist Armando Gola and drummer Ludwig Afonso. 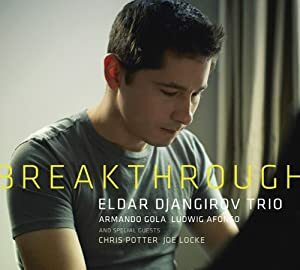 Breakthrough breaks through to reinforce just how powerful and poignant a road tested jazz trio of young lions can be. Captured live in the studio, Breakthrough exudes compositional brilliance, improvisation and interplay. The trio pushes the envelope on Eldar's "Point of View Redux," and features guest vibraphonist Joe Locke on the pianist's dizzying "Blink" and saxophonist Chris Potter on Eldar's impressively layered title track. Eldar's arrangements of Irving Berlin's ballad "What'll I Do" and the whimsical Redd Evans/David Mann composition "No Moon at All" feature electric bassist Gola switching to an acoustic upright instrument, playing evocative lines as Afonso eschews drumsticks to provide stirring brushwork. There's even a telekinetic cover of British pop band Radiohead's "Morning Bell." "There's a special connection within this trio," Eldar says. "It feels like we're all playing one single instrument." All the more remarkable as this youthful unit plays at exhilarating speeds and yet maintains a distinctly heartfelt touch.